Boeing Attempts to Answer the Biggest Question in Motoring: Where's My Flying Car? Discussion in 'Auto News' started by GTPNewsWire, Jan 26, 2019. This article was published by Andrew Evans (@Famine) on January 26th, 2019 in the Automotive News category. So a plane that can drive, cool i guess. Those things will be operational to the masses before GT7 is completed. palqo and Oyashiro-sama like this. Just looks like an airplane that can hover. Which has been a thing for years. The first flying car has to be the Delorean,i don't care how hard it will be to make,go work at it scientists!!!! It reminds me of the Aerocar, though a bit more advanced. An autonomous Personal flying Transport. But it doesn't look lit it is derivable on the streets. So it's Not a Car IMHO. (Dude) where's my flying car? So...they've successfully made a more complicated, less practical helicopter. Congratulations, I guess? Quite a lot of people in my country can hardly control cars as is and barely know basic road safety rules. Imagine if flying cars go into mass production? They're testing autonomous control so you won't have any fun piloting this thing. It's essentially just a huge AI drone with seats, no? This is a flying car. That Boeing thing is an aeroplane that can be used as, sort of, a car. Their called aeroplanes..been going for a good 100+ years now. GTWolverine and AlexDB9 like this. Yeah, why do all these inventors over complicate this flying car thing with their winged vehicles?... why not just go down the tried and tested helicopter route and evolve them into quieter easier to fly machines?.... I mean, why are they even still trying stuff with winged crafts?? Halos are obviously the most simple way to get airborne and landed... That Boeing craft looks like it would need to do a fancy manoeuvre when slowing then land, like Musk's rockets or the Harrier plane... which is an inevitable disaster in the waiting. Also should something go wrong, halos tend to plummet more slowly and dont really explode on impact much, and being able hover or slowdown in mid air quickly, could give time to save it from disaster..., Compared to them dumb winged cars, when it goes wrong and into a nose dive, you're going straight into the deck at high speed..... good luck with that!!! Because helicopters have their fair share of problems when compared to winged craft. The main rotor is one big problem, if operating in an urban environment like these air taxis being developed and tested are planned to operate in. Large rotor blades, which even on smaller helicopters can exceed 30 ft, are extremely vulnerable to damage from electrical wires, trees, and so on. Most air taxi designs utilize powered lift technology similar to an RC quadcopter, which is a magnitude simpler than a conventional helicopter with its swash plates, complex rotor heads, tail rotor and tail rotor drive system, and all the other bits that control the rotor system. Powered lift is also more redundant when using hexacopter, octocopter, and so on, where you have more than 4 motors providing lift and control. The limitation of such tech is that you have to tilt the whole craft to fly forward, and then you have limitations on forward speed, which is where the wings come in. Wings are FAR more efficient at providing lift than rotors or props, and are much simpler and can be smaller in span than rotors to lift an equivalent sized aircraft. LMSCorvetteGT2, Danoff and Wolfe like this. I get what you are saying, you are right there about the downfalls.... I know wings are great for fuel efficiency and sustaining lift compared to a mad amount of rotor power, but that isnt worth dwelling on, especially when talking futuristic concepts...... Also, you have to remember for it to be deemed as a flying car, means it has to be able to drive around decently enough after landing. I just reckon a 'Helicopter' type craft is way easier to envision as a flying car, since its rotor blade would just need stopped parallel to the craft for it to become compact enough to drive around(at least outside a metropolis).... compared to a flying car with wings, it would need its wings taken off after landing(probably manually too)...... I can NEVER see these winged vehicles materializing as flying cars tbh. I dunno why, it s just too dumb or something. like the steam powered car. Also, you have to remember for it to be deemed as a flying car, means it has to be able to drive around decently enough after landing. I don't see any wheels on that. I see casters that were used to put it on the runway, and then were removed for actual takeoff. I don't think this is a flying "car", so much as a personal air vehicle intended to operate without a runway. The quadcopter concept is to get you off the ground without a runway, then it has a giant propeller on the back and wings for the purpose of actually getting to its destination, at which point the quadcoper rotors get you back on the ground without a runway. So it's a prop plane with vertical takeoff and landing. Yeah, I noticed that too.... it is just another "Air Taxi" thing. For possibly picking up and dropping off. No Car part.... Why does it even say Flying Car in the Title? I just said winged vehicles would make crap flying cars. Why does it even say Flying Car in the Title? It's because it's a "flying car", rather than car that flies, or a plane that drives. It's worth noting that "car" itself doesn't mean a four-wheeled vehicle with an engine. Before we had what we know as cars today, a car was any unpowered section of a train (and in the US this is still used relatively commonly; in the UK we tend to prefer carriage). Before that it was a thing horses pulled, with "carriage" and "chariot" both deriving from the same root (fun fact: the names of most automotive body styles derive from horse-drawn carriage styles). Ultimately "car" (from "carrum") just means "carriage", as in the act of carrying or transport rather than the object itself. We've just contracted it from "motorcar" or "autocar" and assumed wheels. Essentially this solution isn't what you'd think of as a vehicle that both drives on roads and flies in the air. It's a vehicle that does the job of a car - door-to-door personal transport - but in the air rather than on the road. Thus it's a "flying car". 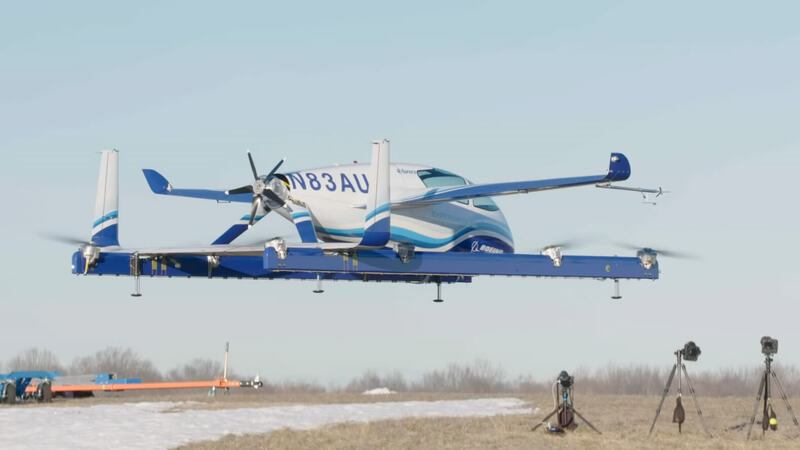 I'll also note that I haven't seen any wheels on it yet, but since Boeing was testing the autonomous VTOL systems there was no need for wheels on the vehicle in this test, so it may end up being more like something we'd recognise as a car down the line. it is just another "Air Taxi" thing. Well... "just another" is a bit too dismissive for me. This is the first time I've seen an aircraft that at least outwardly appears to be quite capable of high speeds that can do VTO in a consumer, light aircraft, setting. It's a really good alternative to a helicopter, especially if no pilot is required. 1. The type found in movies like The Fifth Element, where Bruce Willis has a 'Flying Car' that doesn't drive like a normal car, only flies (if memory serves me)..... and of course you could round this off by saying, why drive at all on the ground, when you may as well just fly everywhere.... and so holds a good point- Why land and Drive at all? 2. The type in movies like Chitty Chitty Bang Bang and Back to the future. A vehicle that flies and drives. See, dropping people off in cities is waaaay off in the future. Remember recently in NYC, they wouldnt let a normal drone patrol New Years partying in Times Square because it may fail and fall onto people below, yet this thing is expected to drop people at the Plaza Hotel, and automatically. With packed streets!! The reason I see the second type of Flying Car coming first is, if in future something like a proper flying car evolves, they will more than likely have landing spots outside cities at different points (like piers or whatever at NSEW of city) this will avoid any packed streets and other disasters... and so you would land at whatever of these points is nearest to where you want to go, then "drive" to your destination.... and so VTOL is a must and being able to change from flying to driving as a car is a must too. So winged stuff is too cumbersome imo, albeit better at flying.... You could evolve a Helicopter into something like that I think way more easily than a plane.